Great minds for a great revolution! For May 1st, in recognition of International Worker’s Day, PRAC/RSM Toronto is working with a number of other anti-capitalist, anti-imperialist organizations to put together a unified march from Nathan Philips Square to Alexandra Park. Unlike the previous year, which saw the march divide into two parts, this year’s march there will only be one march. We hope you join us. You can contact us at revolutionarystudentsto[at]gmail[dot]com to march with us. Unite the struggles of the people on International Workers’ Day! For an anti-capitalist May Day! All over the world on May 1, MAY DAY, millions of people fill the streets to advance the struggles and issues of the working class. On May 1, 2012 in Toronto, we need to also be out in the streets – not as a parade, but as a call to people across the city and across the country. A call to action against the governments of the bankers and the rich who are imposing “austerity” on the people. After decades of spending billions on wars, prisons, police, tax cuts and tax breaks for the rich, subsidies, oil and mining companies and other corporations, they tell us there is an ‘economic crisis’ that justifies their layoffs, wage freezes and reductions, cuts to social programs and higher and more fees for what we need. This is capitalism: their system is the crisis! This is a call to unity against the nationalism, racism, anti-immigrant sentiments, sexism, homophobia, and any other hatred their media creates to keep us divided while the rich continue to line their pockets. Since its founding, Canada has been stealing and plundering First Nations lands, minerals and resources and now launches imperialist wars around the world to plunder other people’s resources. The land rights of First Nations and those of other people fighting for their rights and freedom should be everyone’s fight. The right to work and dignity for those who come as immigrants and migrants need to be the fight of all of us who came as or descend from immigrants. This is a call to reject the rampant consumerism and the social decay, climate chaos and environmental destruction imposed by this system. We don’t want the “growth” that capitalism has to offer. We want a truly democratic and just society that meets the social needs of all people. Capitalism can’t do this. So May Day is a call to all those coming under attack, to the sick and tired, the exploited and oppressed. A call to all unionized workers whose rights and wages were the result of years of struggle, not from supporting this or that party or by back-room negotiations. Remember your role in this society, reclaim the proud history of militant labour. A call to precarious workers with little job security and no benefits. A call to the students struggling to find jobs and tied down to tens of thousands in debt. A call to all the working class women who have to work multiple minimum wage part-time jobs to feed a family. A call to the racialized youth, targeted and brutalized by police and under attack from policies aimed at stuffing their bodies into new prisons. A call to the migrant mothers and fathers, brothers and sisters, who left their homes in for the empty promise of a better life. A call to the indigenous peoples defending their land rights against Canadian colonialism, and a call to all non-indigenous peoples struggles to unite with them. 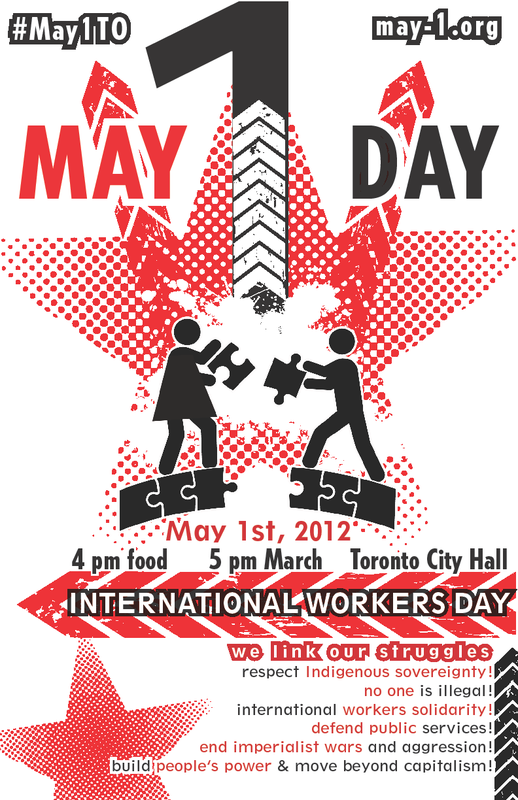 On May 1, 2012, International Workers Day, join us at 4pm at Nathan Phillips Square for a rally and march to respect Indigenous sovereignty, insist that no one is illegal, for international workers solidarity, to defend and expand public services, to stop prison expansion…and corporate handouts, to end imperialist wars and aggression, to build people’s power, and to move beyond capitalism. 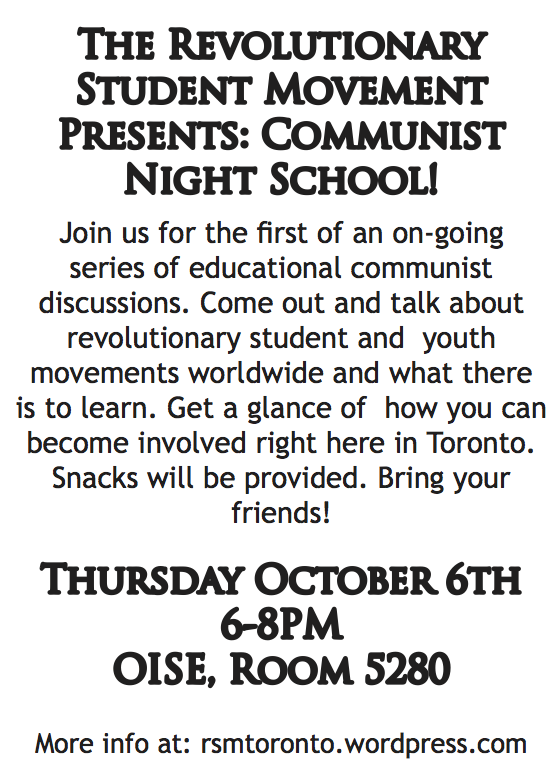 Please read Prakash’s “Where Should Students and Youth Make a New Beginning?” We will also be taking a recent youth issue of the Partisan–a newspaper published by the RCP (Revolutionary Communist Party)–and discussing a segment of it. The newspaper article will be available at the meeting. Our aim is to help students and youth gain a theoretical understanding of our political tasks, as well as brainstorm some practical ideas for realizing our revolutionary goals. Directions: get off at St. George subway station at Bedford, then go West until you see a gray, ramped building. Enter via side entrance and take elevator to the 5th floor. We look forward to seeing you at our launch! Join the Revolutionary Student Movement and the Proletarian Feminist Front for a Revolutionary May Day!